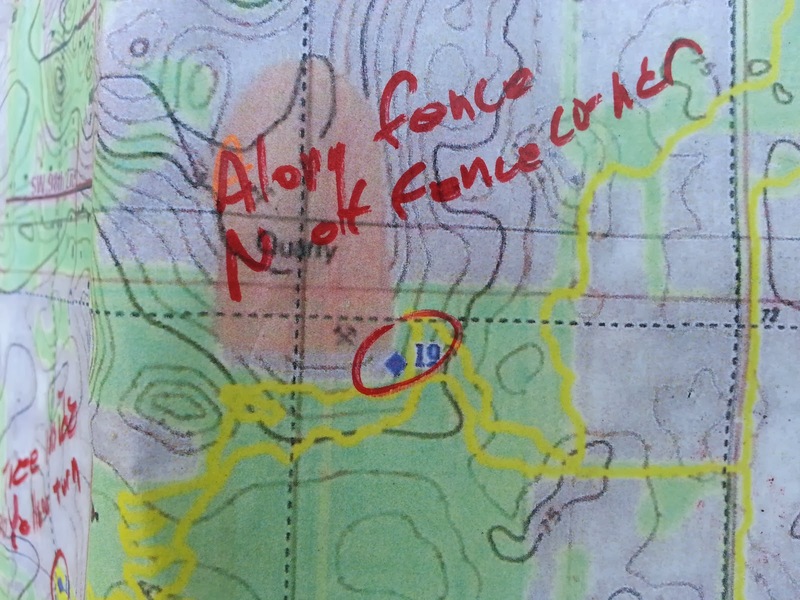 I'll cut right to the chase on this blog posting - and all adventure racers know these situations. 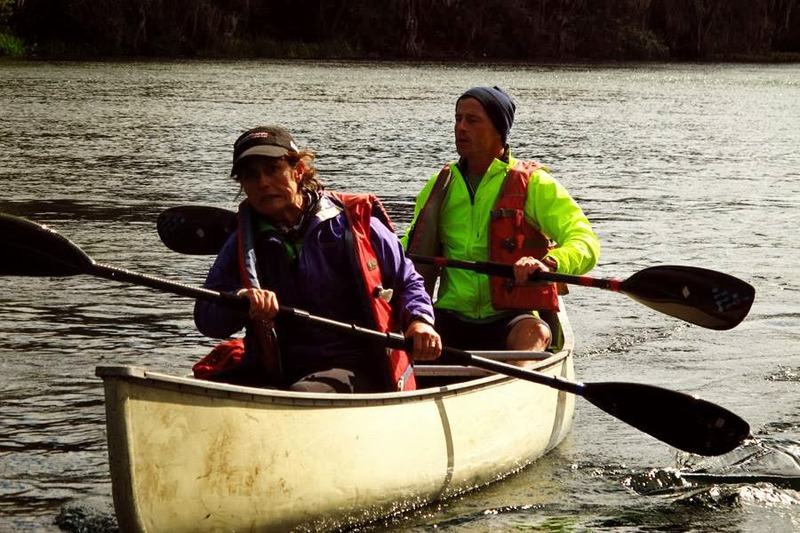 * Paddle (2:17)- Moved to Inglis Locks when the initial paddle had conditions that were too windy. Paddle from the locks to the US41 bridge and back. 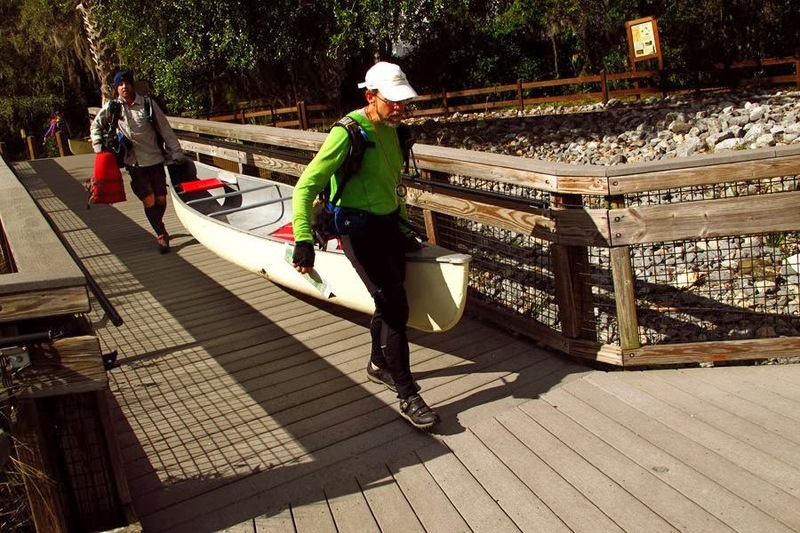 * Paddle (0:29 to Rainbow, 0:37 in Rainbow Springs, 1:09 to blue hole) - Beautiful Paddle up to Rainbow River with a short orienteering at Rainbow River State Park, with a huge waterfall! Then back in boats and south to Blue hole south of SR40. * Bike (9:11) - Ross Prarie trailhead is where we started the first long bike leg - the full single track of Santos, then all the way through Marshall Swamp to the Marshall Swamp trailhead. Very challenging navigation. 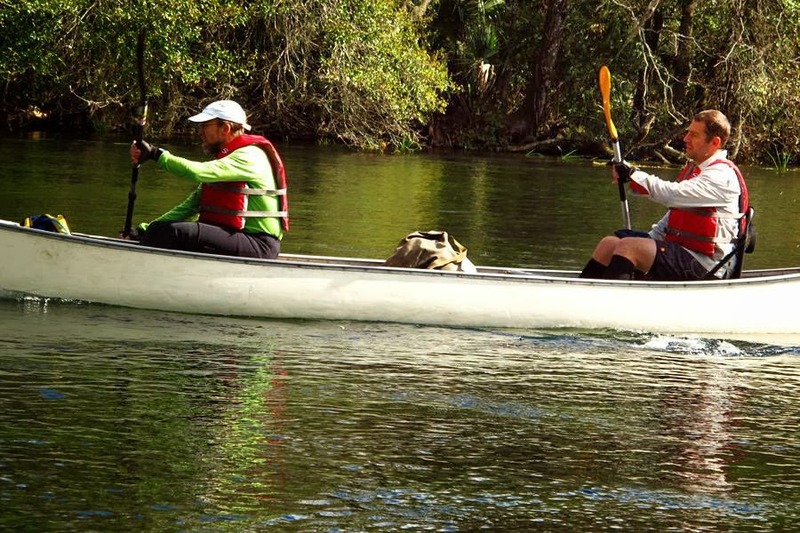 Paddle (3:59) - Paddle down Silver River then south on Oklawaha River to Oklawaha prairie. 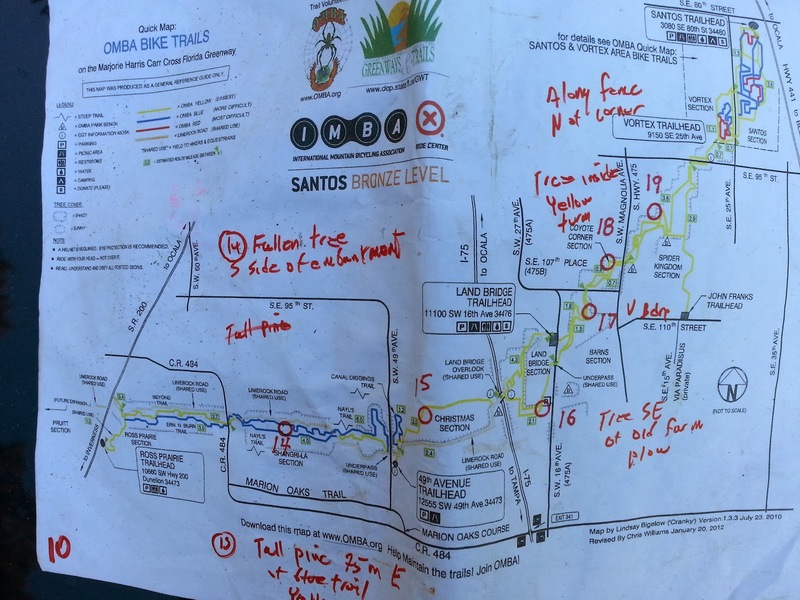 Bike (5:31) - Tough bike leg through Ocala National Forest finishing up at Farles just east of the Avon Park bombing range, some incredibly sandy trails! 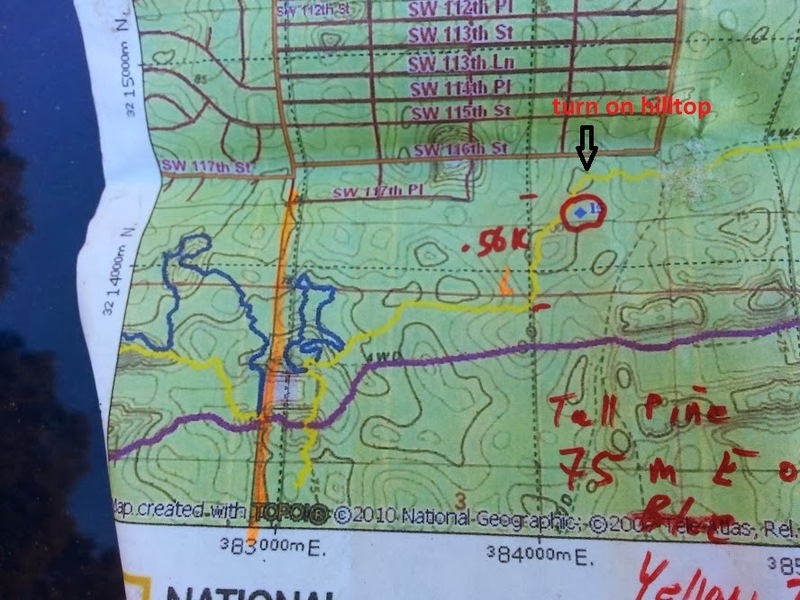 Trek (3:38) - A trek from Farles, primarily along the Florida Trail to CR445 and Alexander Springs. 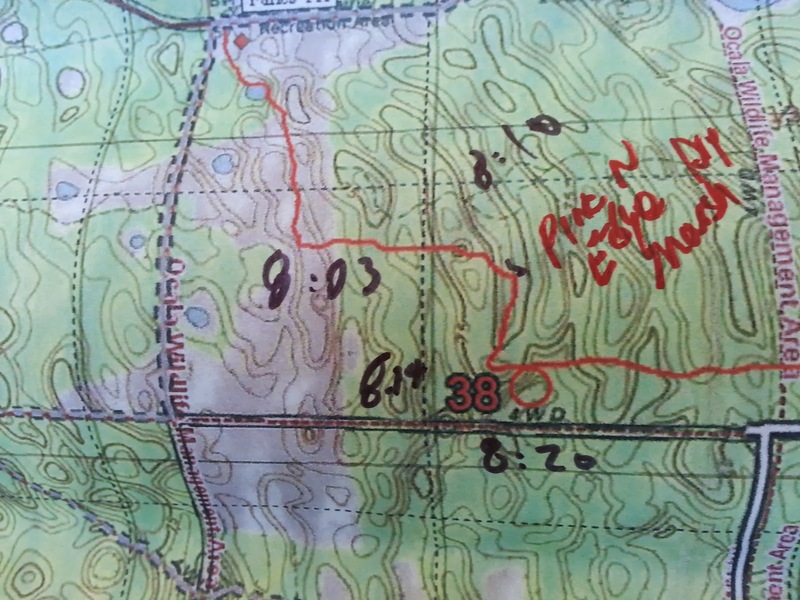 So here we were arriving into the Alexander Springs TA around 11 PM on night 2. We had some physical challenges up to this point. Junos was having some serious tendonitis in his Achilles tendon and was not able to keep any food down. Joe had some serious swelling in his left wrist that looked like he had broken something. It had been terribly cold the previous evening and it was really cold now. I got the tents that Greg had stashed away for racers and set up the big family tent. 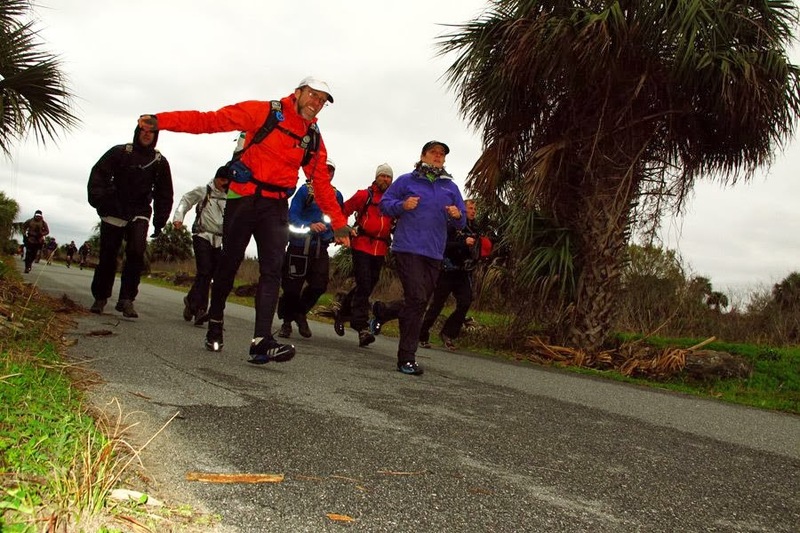 Once set up teams that were cold, tired, and sleep deprived started migrating to the tent. I hopped in and got a solid hour of sleep until my own shivering (I had a sleeping bag but no ground pad). I also had done pretty bad job of setting the tent up delirious and at night. (2) Have a tent set up and ready to go for teams that need rest. - I had a bivvy in my gear bin so setting up for me to sleep was easy. The U-hauls were another sleep option, but their metal floors will have you hypothermic in minutes. Since there is not enough room in most gear bins a tent at the TA is just a nice thing. Luckily they did have one and I really did not mind setting it up, it was just hard to do cold and tired. I slept in it and then gave my sleeping back to another team when we went out on trek. A really good thing was they had some warm pasta here and that helped us quite a bit. 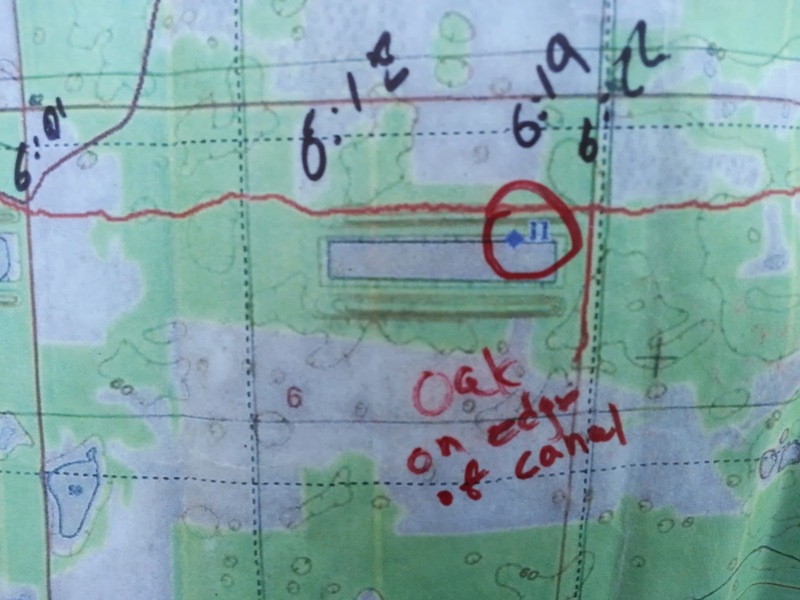 We opted to completely skip the paddle, which had seemed to be allowing Junos tendonitis to flare up and we headed out on the orienteering. This started out great, we nailed the first 5 controls, but as we approached CP6 on the trek - Junos had to stop (completely). 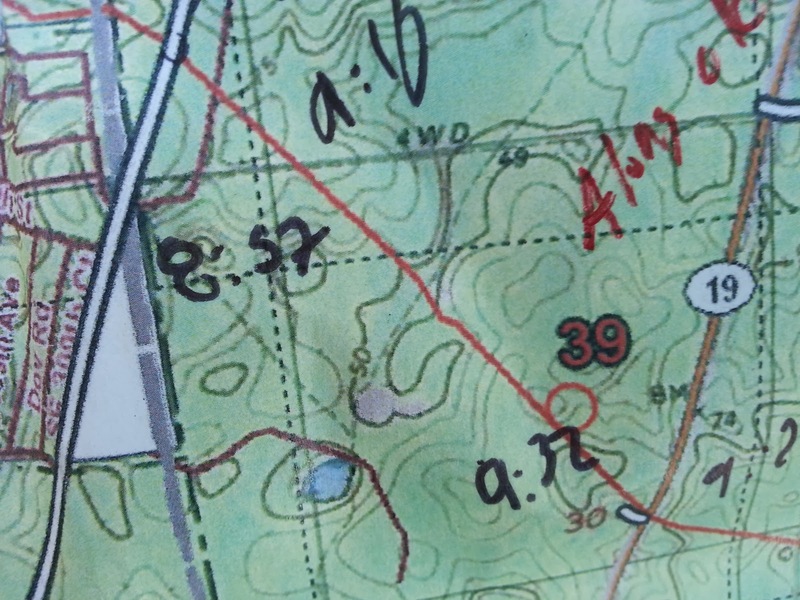 We set him down and allowed him to sleep for a couple of hours at the trail intersection near 6- meanwhile I gave Julie an orienteering lesson so she would understand what I was doing on each control. 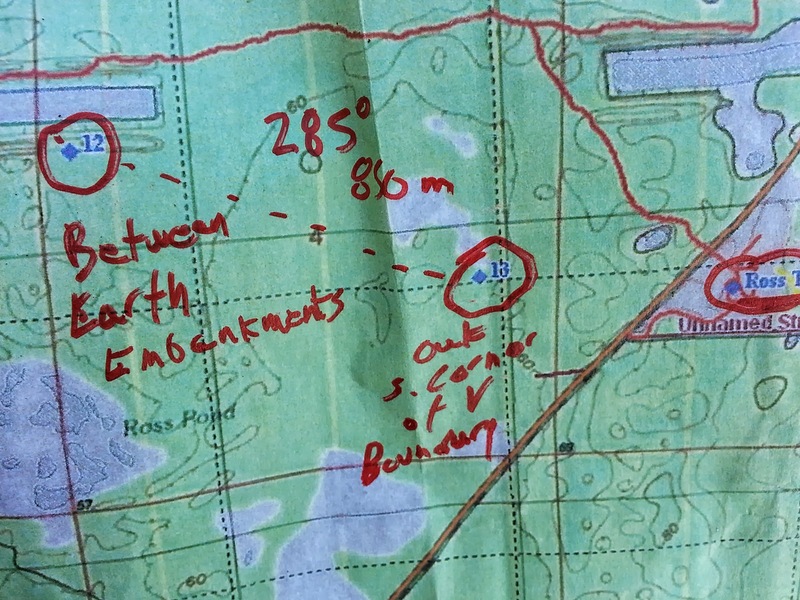 I think she got a new appreciation for the navigation challenges, especially with the high level of map uncertainty - we spend near 2 hours going over how to get CP6 which was not even 100 yards from where Junos was laying. 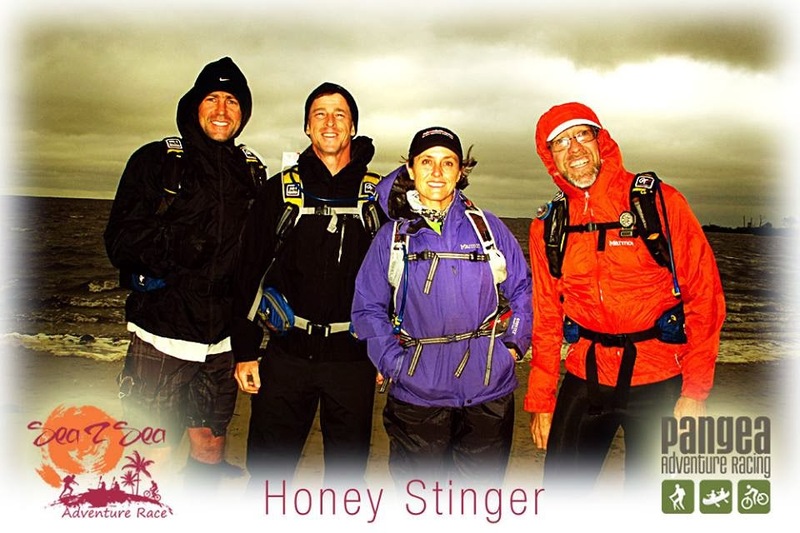 At this stage it appeared the race was over for us, and it was doubtful we would be able to finish. I felt Junos would be able to bike even though Junos did not. 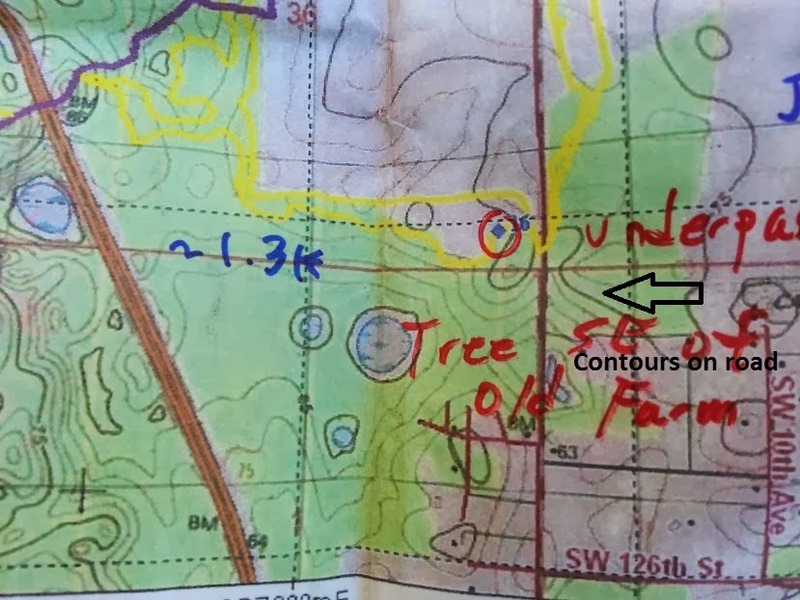 For any Florida teams that would like navigation lessons, especially in dealing with map uncertainty - let Greg or me know and I will be happy to set up a little training session. After a couple of hours we were able to get Junos walking and we limped back to the TA (we were able to visit 7 of 20 controls) and started to work out a plan that would get us to the finish line (intact and as a team) - this was going to be pretty tough, Junos could barely walk, and was only able to use on leg for biking. That would be enough and Greg presented an option that would get us home. 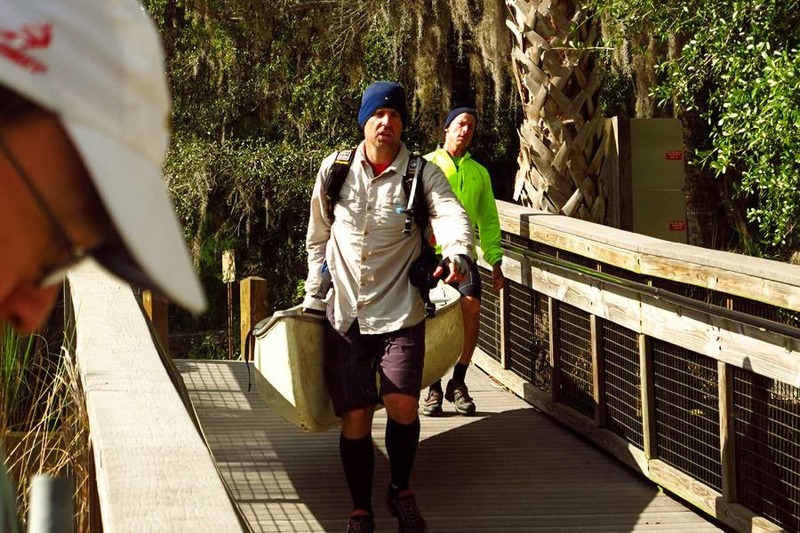 We skipped the bike to the final paddle and headed straight to the finish line (still 75K away). Along the route we decided that we would go ahead and head to the Highbridge TA - we ran across Mia's Misfits along this section at the Kangaroo at US17 and SR40 they were hurting, but would make it to the finish line. We headed to High Bridge (a pretty ride) and were passed by Rev3 about 1/4 mile from the TA. We headed down the beach and were passed by Checkpoint Zero about 30 minutes later. 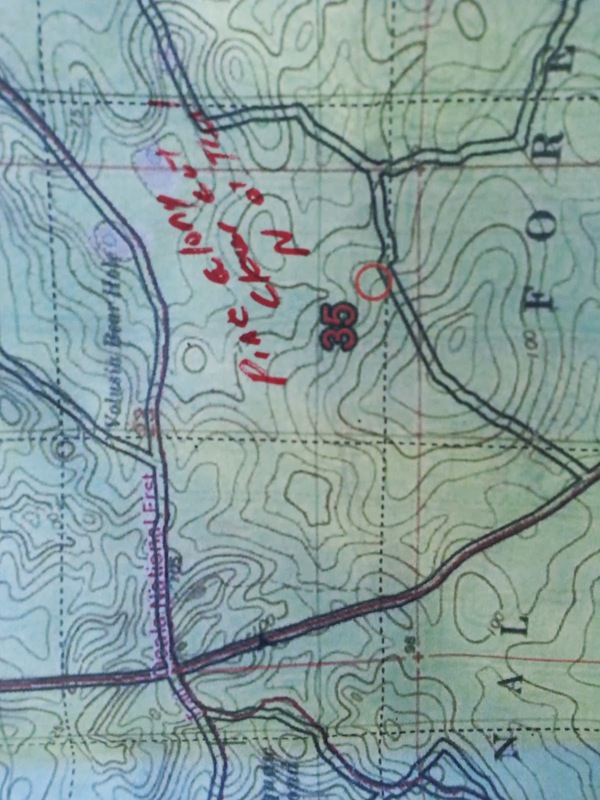 We took the limerock road from 484 and attacked this on foot. 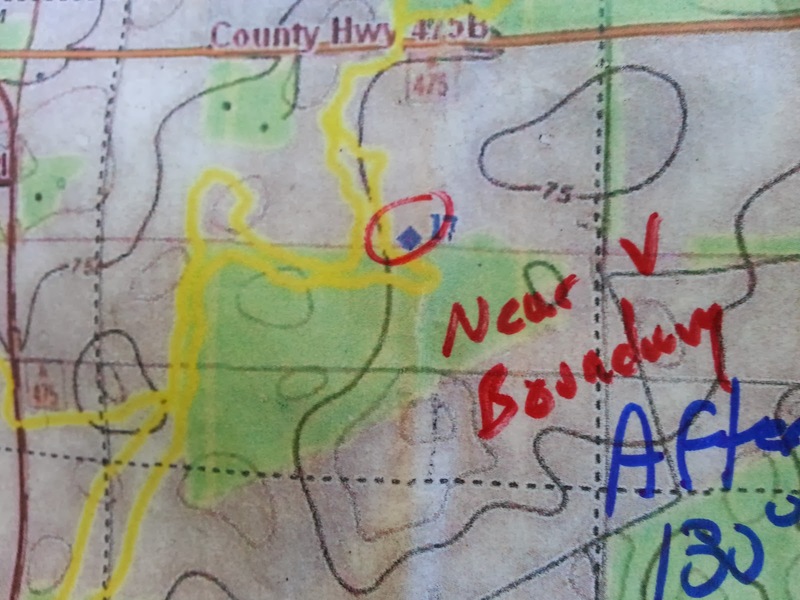 I used the trail bend dimple on the north blue trail to drop the bikes and attack, I used the trail bend on the southern blue trail to finalize my attack and took a bearing and went to it. Joe had followed another team to it when I spotted it, but he was already there. This one was incredibly challenging. 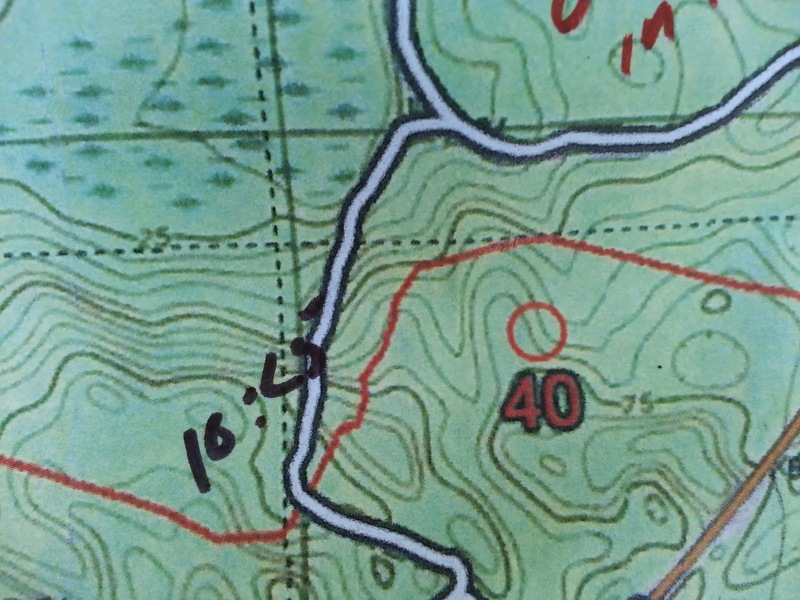 The southern trail bend and the northern trail bend were both subtle - meaning any measurement off them to create an attack would be challenging. 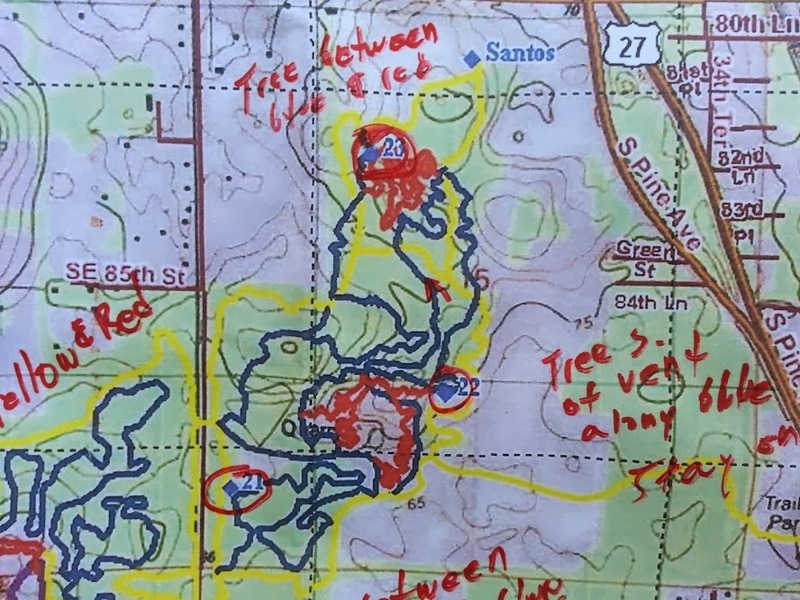 The control was 75m off the trail and the forest had a lot of tall pines and was thick - thus making a dead-on attack crucial. This control took us a solid 30 extra minutes. This control will be infamous - The plowshare. I first mistakenly took the spot where the trails crossed the road to be the underpass and used this as an attack. 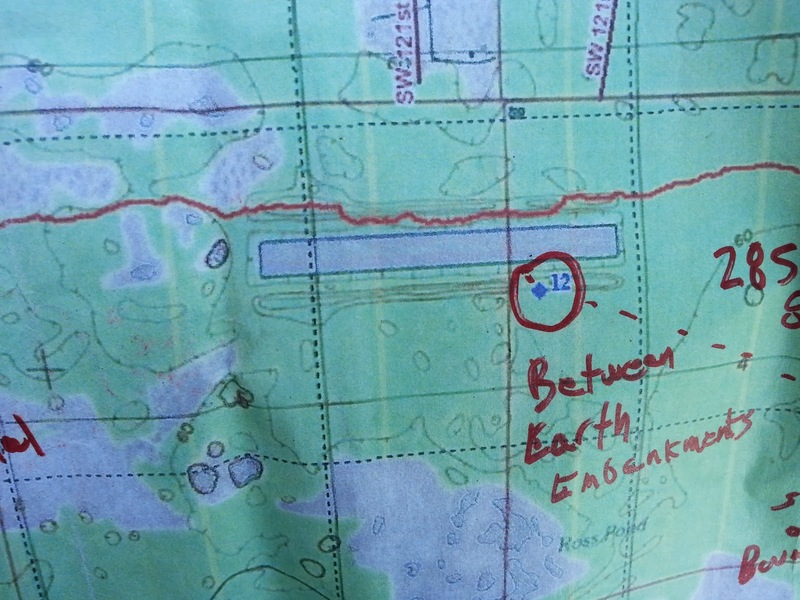 However the mapped trail here was NOT what the trail did, and we figured this out after wasting 45 minutes. 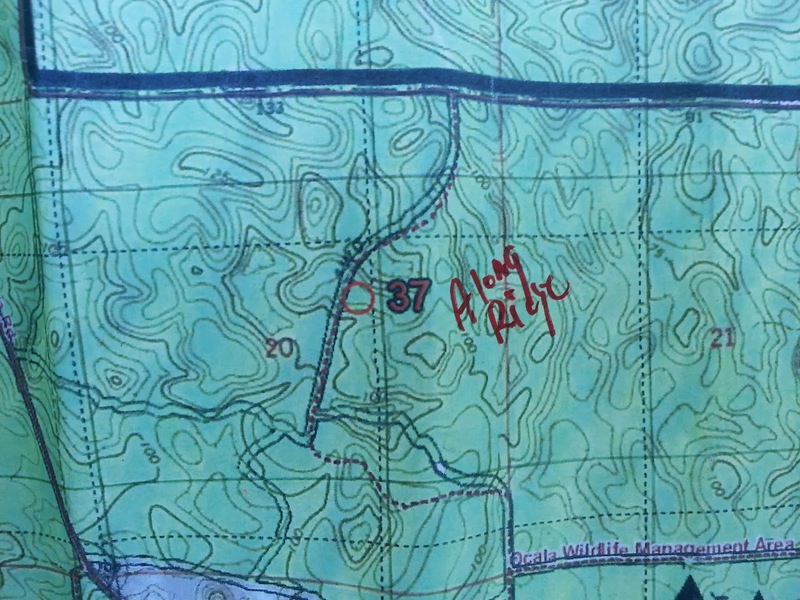 At this point many teams were giving up on this one - eventually I found it by (1) going out to paved road, (2) using the contours along the road, (3) finding the "old" trail crossing at the road - which I knew was real as there were old signs along it, (4) shooting a bearing from this crossing. 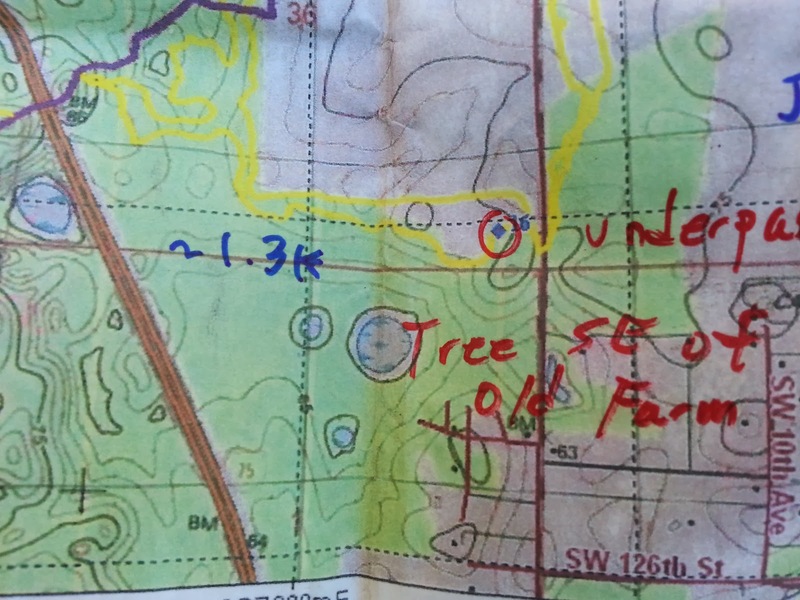 The team had been arguing here and I was extremely frustrated at this point - but we did find it. 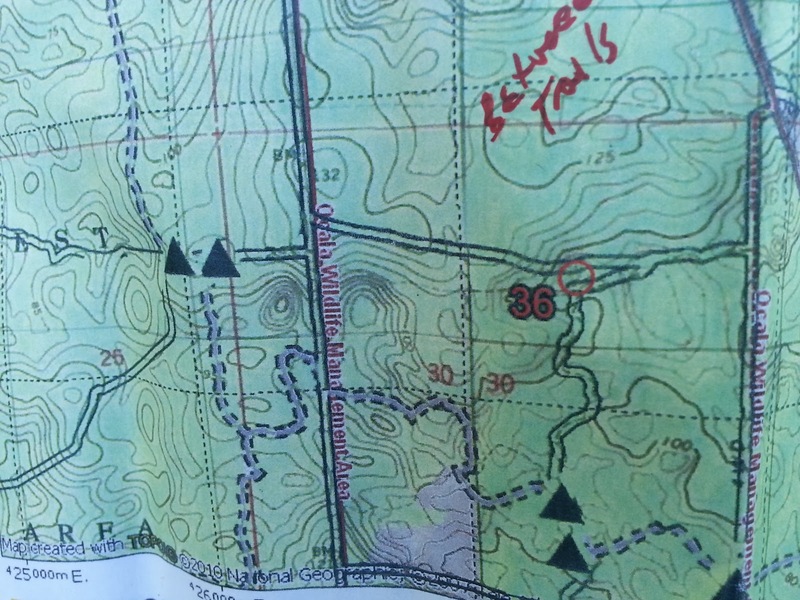 None of the remaining controls gave us much trouble, we did have a short challenge at CP22 - though once we figured the line thickness of the trail lines obscured some of the detail - we found the vent and solved this. I had no issues on any other CP's so if anyone wants my strategy on any of the other controls - just post a comment and I'll give my strategy. 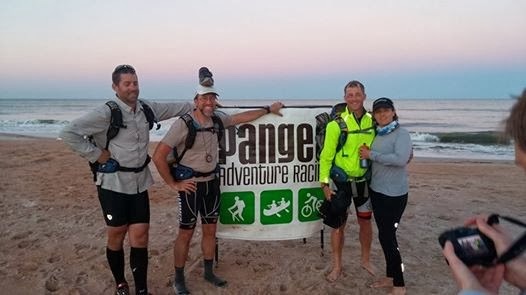 Pangea sets another incredible and challenging course - and I truly enjoyed each section - thanks much! 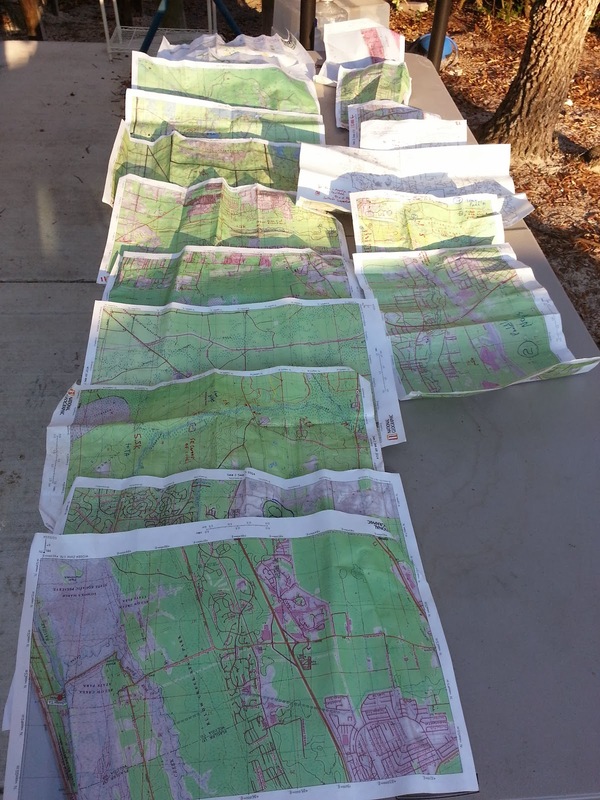 There it is - the entire set of maps for the 2014 Pangea Sea to Sea. These kept my first 3800 lumen light going for 10 solid hours. It does not give you a lot of warning before it goes out, though the LED in the back of the light will turn from green to red about 15 minutes before it dies, though that does not do you much good if it is on your head. Before a race run them through a few cycles to get a feel for their time with your lights. 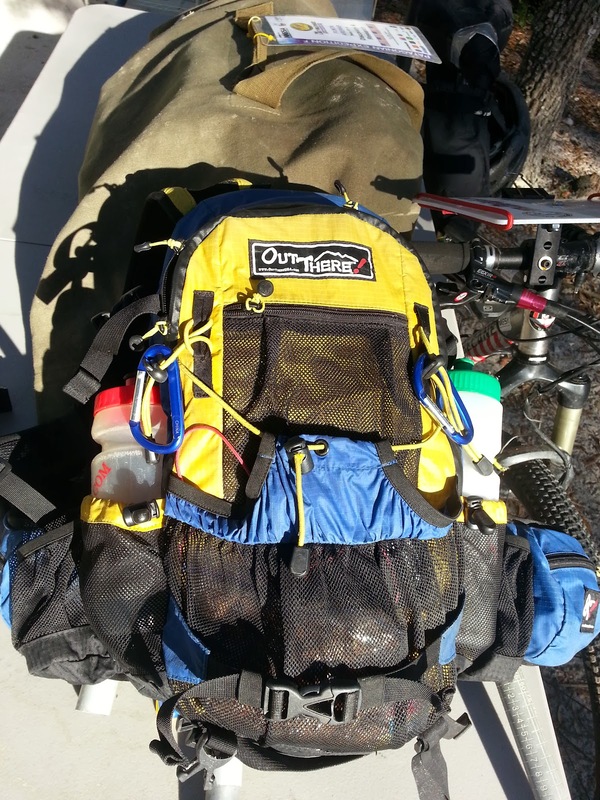 Also here is a picture of my pack, left water bottle held Perpetuem, the right one Gatorade, and the bladder held water - I stayed very hydrated which also kept me warm. Great race report Dr. Ron. I was the one who set the controls for Santos (CP14-23). 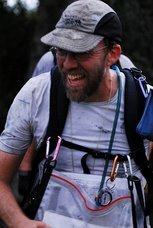 Greg texted me during the race and told me how much trouble CP16 was giving the teams. I was surprised because I thought that one was one of the easier ones. 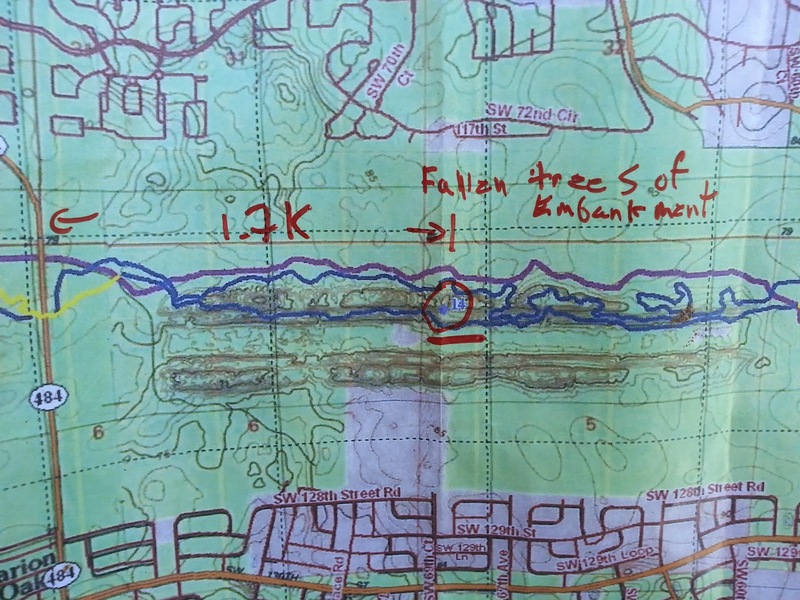 But, when I placed it I attacked it by riding south from the Landbridge TH on the main road to the trail crossing. I had already calculated the distance from the TH to the crossing, so I knew it was not the underpass. After that it was easy. I assume you guys attacked it by riding the yellow trail east from 75 right? Also, thank you for the recommendations. I already have that light so now I am going to buy that battery pack.